Nervous systems throughout the animal kingdom vary in structure and complexity, as illustrated by the variety of animals shown in [link]. Some organisms, like sea sponges, lack a true nervous system. Others, like jellyfish, lack a true brain and instead have a system of separate but connected nerve cells (neurons) called a “nerve net.” Echinoderms such as sea stars have nerve cells that are bundled into fibers called nerves. Flatworms of the phylum Platyhelminthes have both a central nervous system (CNS), made up of a small “brain” and two nerve cords, and a peripheral nervous system (PNS) containing a system of nerves that extend throughout the body. 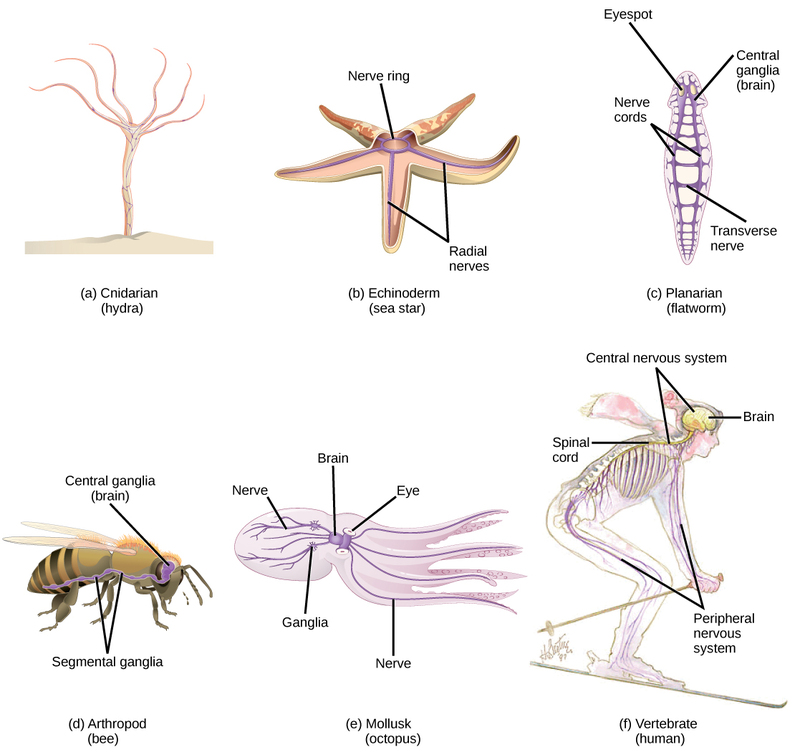 The insect nervous system is more complex but also fairly decentralized. It contains a brain, ventral nerve cord, and ganglia (clusters of connected neurons). These ganglia can control movements and behaviors without input from the brain. 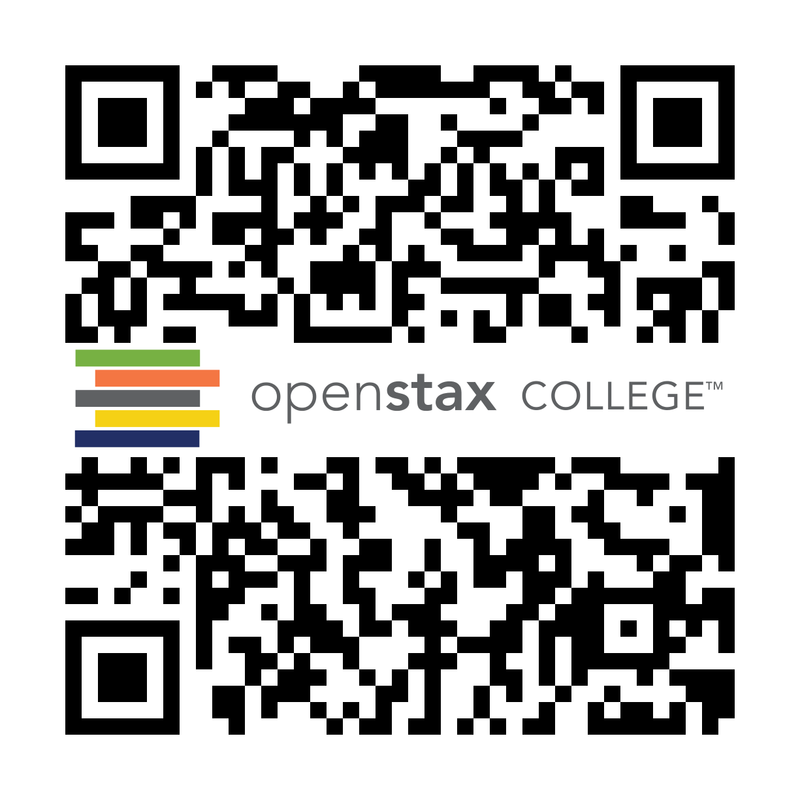 Octopi may have the most complicated of invertebrate nervous systems—they have neurons that are organized in specialized lobes and eyes that are structurally similar to vertebrate species. Like other cells, each neuron has a cell body (or soma) that contains a nucleus, smooth and rough endoplasmic reticulum, Golgi apparatus, mitochondria, and other cellular components. Neurons also contain unique structures, illustrated in [link] for receiving and sending the electrical signals that make neuronal communication possible. Dendrites are tree-like structures that extend away from the cell body to receive messages from other neurons at specialized junctions called synapses. Although some neurons do not have any dendrites, some types of neurons have multiple dendrites. Dendrites can have small protrusions called dendritic spines, which further increase surface area for possible synaptic connections. Neurons contain organelles common to many other cells, such as a nucleus and mitochondria. They also have more specialized structures, including dendrites and axons. There are different types of neurons, and the functional role of a given neuron is intimately dependent on its structure. There is an amazing diversity of neuron shapes and sizes found in different parts of the nervous system (and across species), as illustrated by the neurons shown in [link]. There is great diversity in the size and shape of neurons throughout the nervous system. Examples include (a) a pyramidal cell from the cerebral cortex, (b) a Purkinje cell from the cerebellar cortex, and (c) olfactory cells from the olfactory epithelium and olfactory bulb. While there are many defined neuron cell subtypes, neurons are broadly divided into four basic types: unipolar, bipolar, multipolar, and pseudounipolar. 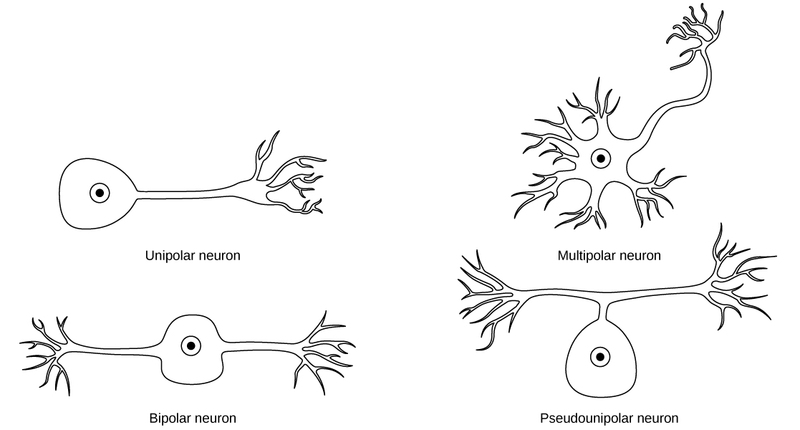 [link] illustrates these four basic neuron types. Unipolar neurons have only one structure that extends away from the soma. These neurons are not found in vertebrates but are found in insects where they stimulate muscles or glands. 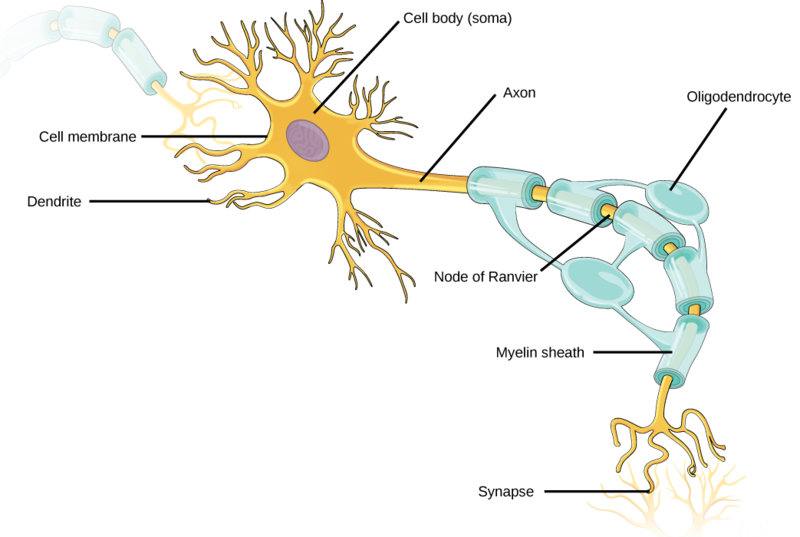 A bipolar neuron has one axon and one dendrite extending from the soma. An example of a bipolar neuron is a retinal bipolar cell, which receives signals from photoreceptor cells that are sensitive to light and transmits these signals to ganglion cells that carry the signal to the brain. Multipolar neurons are the most common type of neuron. Each multipolar neuron contains one axon and multiple dendrites. Multipolar neurons can be found in the central nervous system (brain and spinal cord). An example of a multipolar neuron is a Purkinje cell in the cerebellum, which has many branching dendrites but only one axon. Pseudounipolar cells share characteristics with both unipolar and bipolar cells. A pseudounipolar cell has a single process that extends from the soma, like a unipolar cell, but this process later branches into two distinct structures, like a bipolar cell. Most sensory neurons are pseudounipolar and have an axon that branches into two extensions: one connected to dendrites that receive sensory information and another that transmits this information to the spinal cord. Neurons are broadly divided into four main types based on the number and placement of axons: (1) unipolar, (2) bipolar, (3) multipolar, and (4) pseudounipolar. How do scientists identify new neurons? A researcher can inject a compound called bromodeoxyuridine (BrdU) into the brain of an animal. While all cells will be exposed to BrdU, BrdU will only be incorporated into the DNA of newly generated cells that are in S phase. A technique called immunohistochemistry can be used to attach a fluorescent label to the incorporated BrdU, and a researcher can use fluorescent microscopy to visualize the presence of BrdU, and thus new neurons, in brain tissue. [link] is a micrograph which shows fluorescently labeled neurons in the hippocampus of a rat. There are several different types of glia with different functions, two of which are shown in [link]. 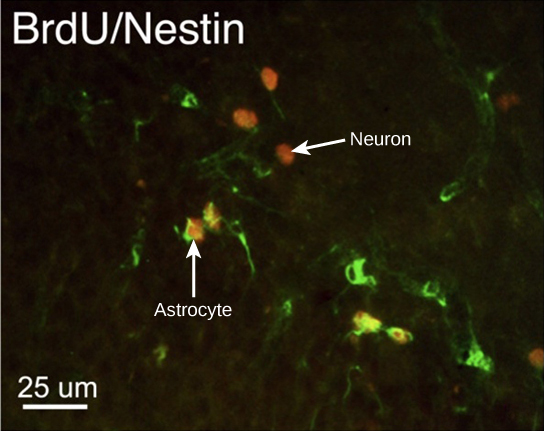 Astrocytes, shown in [link]a make contact with both capillaries and neurons in the CNS. They provide nutrients and other substances to neurons, regulate the concentrations of ions and chemicals in the extracellular fluid, and provide structural support for synapses. Astrocytes also form the blood-brain barrier—a structure that blocks entrance of toxic substances into the brain. Astrocytes, in particular, have been shown through calcium imaging experiments to become active in response to nerve activity, transmit calcium waves between astrocytes, and modulate the activity of surrounding synapses. Satellite glia provide nutrients and structural support for neurons in the PNS. Microglia scavenge and degrade dead cells and protect the brain from invading microorganisms. Oligodendrocytes, shown in [link]b form myelin sheaths around axons in the CNS. One axon can be myelinated by several oligodendrocytes, and one oligodendrocyte can provide myelin for multiple neurons. This is distinctive from the PNS where a single Schwann cell provides myelin for only one axon as the entire Schwann cell surrounds the axon. Radial glia serve as scaffolds for developing neurons as they migrate to their end destinations. Ependymal cells line fluid-filled ventricles of the brain and the central canal of the spinal cord. They are involved in the production of cerebrospinal fluid, which serves as a cushion for the brain, moves the fluid between the spinal cord and the brain, and is a component for the choroid plexus. 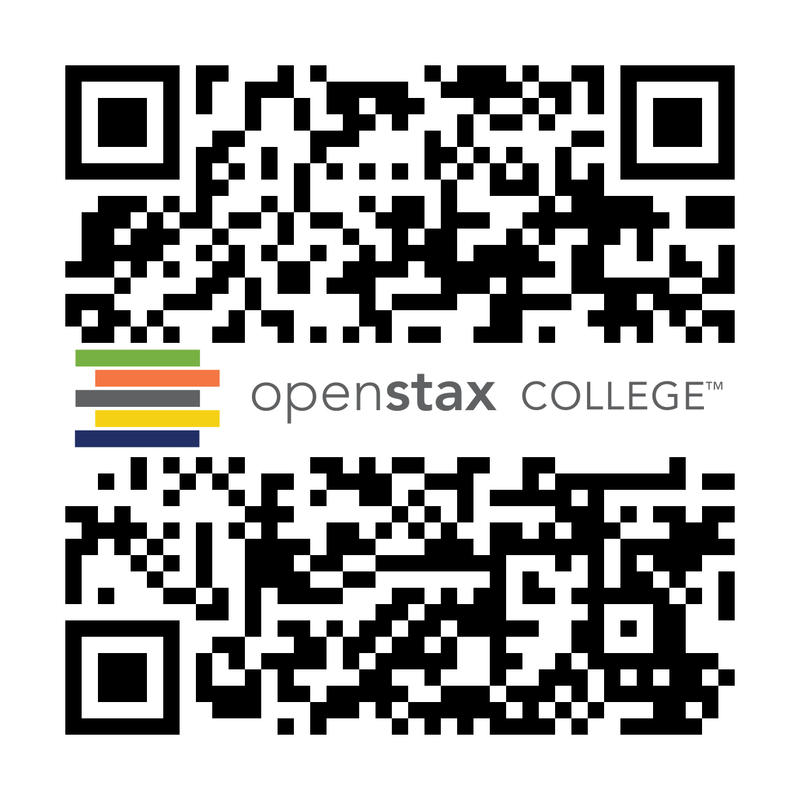 Neurons and Glial Cells by OpenStaxCollege is licensed under a Creative Commons Attribution 4.0 International License, except where otherwise noted.